Commemorate the newlywed's first dance as man and wife with this timeless homage to old-fashioned romance. Commemorate the newlywed's first dance as man and wife with this timeless homage to old-fashioned romance. Chicago-based artist Alexander Doll sets scenes of wedded bliss in the context of classic print announcements that are as stunningly unique as they are timeless. 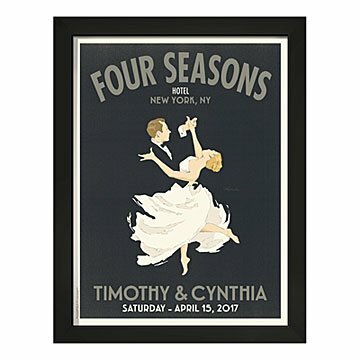 Sure to sweep the wedded pair off their feet, this nostalgic print hearkens back to the nuptial announcements of yesteryear with its sharp, sans serif typography, and hand-sketched illustration of the bride and groom caught up in the music and the moment. Alexander incorporates personal details, such as the venue, city, date, and the couple's names. He even offers hair and skin color options to give each print a personal touch. A sophisticated way to fete an unforgettable occasion, this inspired gift captures the couple's version of their fairytale while giving them a stylish and whimsical work of art to remember the thrill of the day with every passing glance. Printed on archival paper using archival pigment ink in Ohio. Arrives ready to hang in a matte black frame made from Eucalyptus grandis wood sourced from Brazil. I've bought this (or variation of) 3 times for friends wedding gifts. It always comes out beautiful and everyone ooos and ahhhs at them. Glad to be able to give them a cool memory of the day to hang on their wall. Make more of the wedding themed pictures as anniversary commemorative s.
The personalized artwork turned out perfect. I love that this artwork is so personal and commemorates such an important event. It's something that will last a lifetime! My husband and I recently got married a historic victorian home in California and we bought this item to be our welcome sign into the ceremony and reception. Upon seeing the design, my fiancÃ© and I fell in love with the piece and we knew that it would be a perfect addition to our wedding. We had so many compliments on the sign it really attributed to the overall magic of the evening. The beauty of the piece is that we can hang it in our home and have it represent an unforgettable evening we will always cherish. This is an awesome poster! This is a wedding gift for my grandson and his fiance, soon to be married. It is perfect for them. Love the quality and the colors. I chose sage for the writing and it is perfect. It made a very nice PERSONALIZED gift and had meaning to the giver and receipients. My sister and her new husband loved the print, it was absolutely beautiful. Would purchase again.